EU policy proposals to curb automated trading strategies have aroused concern from financial players who fear they will have serious ramifications, reports Will Henley. 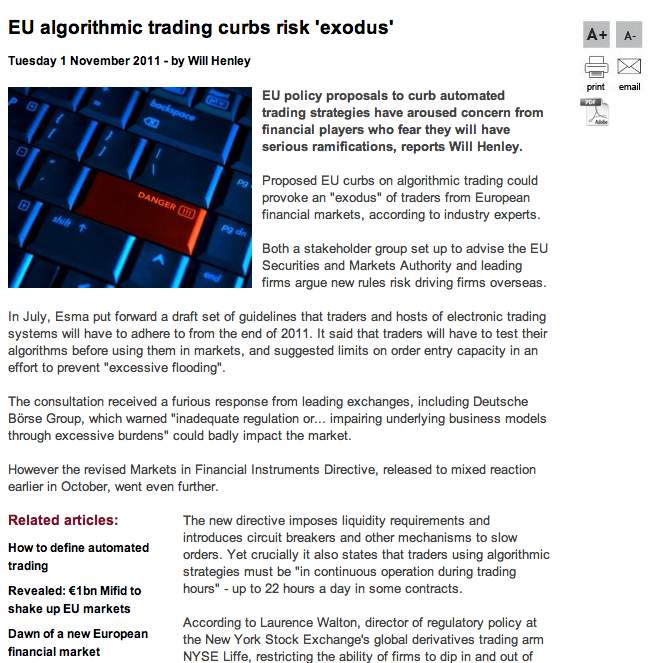 Proposed EU curbs on algorithmic trading could provoke an “exodus” of traders from European financial markets, according to industry experts. Both a stakeholder group set up to advise the EU Securities and Markets Authority and leading firms argue new rules risk driving firms overseas. In July, Esma put forward a draft set of guidelines that traders and hosts of electronic trading systems will have to adhere to from the end of 2011. It said that traders will have to test their algorithms before using them in markets, and suggested limits on order entry capacity in an effort to prevent “excessive flooding”. The consultation received a furious response from leading exchanges, including Deutsche Börse Group, which warned “inadequate regulation or… impairing underlying business models through excessive burdens” could badly impact the market. However the revised Markets in Financial Instruments Directive, released to mixed reaction earlier in October, went even further. The new directive imposes liquidity requirements and introduces circuit breakers and other mechanisms to slow orders. Yet crucially it also states that traders using algorithmic strategies must be “in continuous operation during trading hours” – up to 22 hours a day in some contracts. According to Laurence Walton, director of regulatory policy at the New York Stock Exchange’s global derivatives trading arm NYSE Liffe, restricting the ability of firms to dip in and out of the market could force many firms to simply turn their backs on Europe, while other market users will be hit by reduced liquidity and limited capacity to hedge. “Whereby firms today can enter the market at their own free will and withdraw at their own free will, [under current proposals] depending on their risk profile, if a firm’s trading is regarded as algorithmic in nature it would have to be present in the market – open to close – regardless of how volatile the market is and what conditions are,” Walton says. “That is a very high bar to meet. As a matter of principle we think it is not prudent to force any entity to expose themselves to risk in all market conditions throughout the entire trading day. The proposal will make it very difficult for firms to manage their risk, agrees Matthew Oswald, director at PwC, who claims that regulators will probably have to find some kind of carve-out in extreme conditions. A position paper released on Friday by Esma’s newly created stakeholder group, chaired by Guillaume Prache, managing director of the Federation of European Investors, agreed with the authority’s central premise that there is a need for regulation to address the risks of HFT and to help level the playing field. Yet the stakeholder group, which includes Judith Hardt, secretary general of the Federation of European Securities Exchanges, and Peter de Proft, director general of the European Fund and Asset Management Association, also warned that Europe risks pushing business overseas. In particular, it urged rule drafters to ensure that any regulations apply across all platforms, as it raised the prospect that, without such a guarantee, firms might otherwise leave the EU market. “Some members consider that the increased prevalence of HFT is a worrying signal for the stability of Europe’s capital markets and strongly recommend that its impact be studied decisively,” the paper states. “In order to avoid any distortion, the rules should be the same on all trading platforms and investment firms, including OTC. In the absence of such a comprehensive coverage, regulation would be ineffective it would only encourage HFT to shift to other jurisdictions,” it said. The view is shared by traders too. Graeme Burnett, chief information officer for Celeritas Markets, a multi-venue proprietary trading house, says the EU clampdown could force firms like his own out of Europe. “The draft proposals are ill-conceived and impractical,” he says. So what is the future, if the proposals are implemented as conceived? While some have apocalyptic visions, others believe a watering down of the proposals will simply follow when Esma completes its technical advice on implementing Mifid. “The only way you could feel comfortable trading [if the proposals are implemented as outlined],” says Walton, “is by doing things by non-algorithmic methods.